The fantasy football season is in full swing and while everyone knows to start Alvin Kamara, what about the under-the-radar players who can help owners in Week 7? On the other hand, not all players should be in your fantasy football starting lineup every week. We recommend the players that will be sleepers and busts in Week 7. The fantasy football season is in full swing and while everyone knows to start Alvin Kamara, what about the under-the-radar players who can help owners in Week 7? On the other hand, not all players should be in your fantasy football starting lineup every week. We recommend the players that will be sleepers and busts in Week 7. 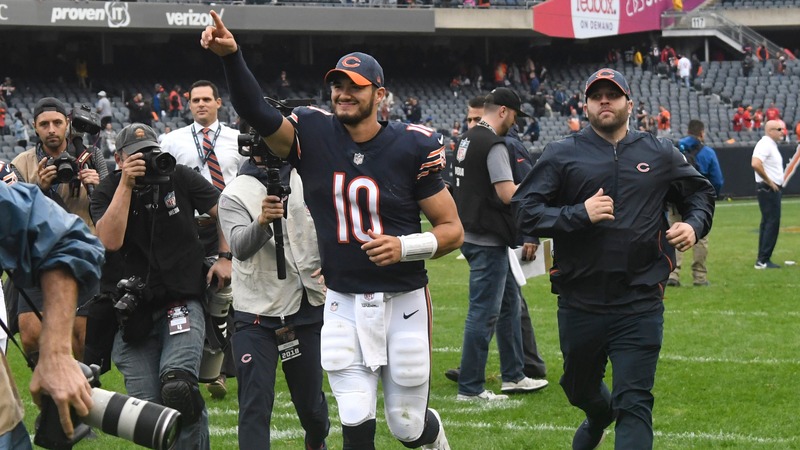 ## Sleepers ## Mitchell Trubisky, Bears After throwing just two touchdown passes in his first three games, Trubisky has nine in his last two. He's also topped 300 yards in each of his last two starts. This week Trubisky faces a Patriots defense allowing 270 yards through the air on the season. If you're in a two-quarterback league or need a bye week replacement, Trubisky is a strong option at home versus the Patriots. ## Ito Smith, RB Falcons [Devonta Freeman was placed on injured reserve](https://www.betchicago.com/fantasy-football-devonta-freeman-injury-ito-smith-falcons) Tuesday and is out for the rest of the season. Smith can no longer be ignored. The rookie running back has now scored a touchdown in three straight games and he saw a career-high 13 touches on Sunday. Smith has twice as many red zone carries (14) as Tevin Coleman (7). This week Smith faces a Giants defense allowing the 12th most fantasy points to running backs. Don't wait another week to get Smith into your starting lineups. __More Fantasy:__ [Week 7 DFS value plays](https://www.betchicago.com/dfs-nfl-week-7-value-plays-tarik-cohen-fantasy-football) ## Chester Rogers, WR Colts Over the last three weeks, Rogers has quietly emerged as a Top 25 receiver in PPR leagues finishing as the WR20, WR24 and WR21 over that span. With T.Y. Hilton out, Rogers has taken over as the Colts' No. 1 receiver. He has 11, 11 and 10 targets in the last three games and with the Colts struggling to run the football, Andrew Luck is leading the NFL in attempts, averaging 48 passes a game. Hilton is expected to return this week but Rogers should still be heavily involved in the offense with plenty of targets to go around. ## David Njoku, TE Browns Njoku's value is on the upswing with Mayfield at quarterback. In the last three games with Mayfield under center, Njoku has seen 30 targets, gained at least 50 yards in every game and scored once. This week Njoku has a chance for a breakout performance against a Buccaneers defense allowing the most fantasy points to tight ends. Five tight ends have gained at least 50 yards receiving against the Browns this year. Njoku is a TE1 this week. ## Busts ## Deshaun Watson, QB Texans Watson has been performing well overall for fantasy owners. Up until last week, he had thrown for at least 375 yards in three straight games. However, the Texans are having issues on the offensive line and you have to think that after putting up two lackluster efforts, the Jaguars will come to play at home Sunday. Jacksonville is still allowing the fewest fantasy points per game to quarterbacks and the Jaguars' defense has given up just five passing touchdowns in six games. If you have another good option at quarterback this week, leave Watson on the bench. ## Carlos Hyde, RB Browns Hyde's fantasy value has been tied heavily to scoring and he hasn't found the end zone in two straight games. In those games, he's rushed for just 97 yards on 31 carries. Another problem for Hyde is Duke Johnson is starting to play more snaps, limiting his impact as a receiver (2 receptions the last two weeks). The Buccaneers' defense allows a lot of fantasy points to every position and running back is no exception. However, the Bucs give up just 66 yards a game on the ground but 6.2 receptions and 66 yards receiving to running backs. That sets up more for Johnson to have success than Hyde. If Hyde doesn't score this week, he won't be much of a factor. __Play and win:__ [NFL Sunday Bears $10K Giveaway](https://betchicago.chalkline.com/games/nfl-sunday-bears-10k-giveaway?external_referrer=https%3A%2F%2Fwww.betchicago.com%2Fweek-6-nfl-trend-plays-betting-odds) ## Will Fuller, WR Texans Like Watson, Fuller faces a tough matchup against the Jaguars' defense. Jacksonville is allowing the fewest fantasy points to the receiver position. Only two receivers have scored on the Jaguars this season and oddly enough, it's Cole Beasley and Chris Hogan, who each caught two touchdown passes. The Jaguars rarely give up big plays through the air and that's what Fuller feasts on. If you start Fuller, you're hoping he makes one big play versus the best pass defense in the NFL. ## Kyle Rudolph, TE Vikings As I say every week, the tight end position is so weak, you're likely not sitting the few good options like Rudolph very often. However, if you have Rudolph and an O.J. Howard, for example, leave the Vikings' tight end on the bench. The Jets are allowing the fewest fantasy points to tight ends. Only one tight end (Eric Ebron) has topped three receptions and 30 yards against the Jets. New York has also allowed just three touchdowns to the position with two coming last week. On paper, Rudolph has the worst matchup of any tight end in Week 7.